2013 Pentagon budget: Why so much spending on big-war weapons? What Happened to a Leaner, Meaner Military? The Pentagon budget again calls for more pricey, big-war weapons than we need. Photo by Jacquelyn Martin-Pool/Getty Images. After two earlier rollouts—the announcement of a new “defense strategic guidance” on Jan. 5 and the top-line numbers for the new defense budget three weeks later—the Pentagon today finally released its actual budget request for fiscal year 2013, with all the details attached. When you read through the mountain of pages and appendixes, a curious discrepancy sticks out. There is a mismatch between the defense strategy and the defense budget. The strategy emphasizes a “leaner, meaner” military, with more emphasis on small-scale campaigns, special-ops forces, and unmanned aircraft. But the budget lays out the usual bounty for large-capital, big-war weapons systems. This isn’t necessarily a contradiction. No strategy or budget should bet all of its resources on one scenario. The world is an uncertain, dangerous place; it only makes sense to hedge bets, and some hedges are unavoidably expensive. Still, the balance between preparing for the likely and hedging for the unlikely is getting a bit out of hand—I suspect mainly for reasons of bureaucratic politics and economics. Take the F-35 Joint Strike Fighter, the stealth plane that former Secretary of Defense Robert Gates boosted when he halted production of its bigger cousin, the F-22. The program has been out of hand for some time—management problems, huge cost-overruns, substantial performance shortfalls. Yet at the rollout of the basic outlines of the defense budget on Jan. 16, the current secretary, Leon Panetta, said he was going ahead with the F-35 anyway, with only minor cutbacks. It’s time to ask a more basic question, the same one that Gates asked of the F-22: How many expensive, hugely complex, overdesigned, short-range fighter planes do we really need? The question becomes especially pertinent when the budget reveals that the Pentagon wants to spend $800 million to improve the 183 F-22s that already existed when Gates stopped the production line and $2.2 billion to buy 26 more advanced F/A-18 fighter-attack planes—an old model, but they keep improving it and building more. Gates kept, and accelerated, the F-35 when he halted the F-22, in part on the old chestnut that you can’t kill something with nothing. To the Air Force brass (and to legislators in the 46 states where the program’s subcontracts were shrewdly spread out), the F-22 was the most cherished program in the entire budget. So Gates let them keep the F-35 (which used a lot of the same subcontractors). Now it’s worth asking whether there is a substantive need for this plane. Another example, where the Pentagon has made a partial compromise: the nuclear-weapons complex. The Navy had been planning to move ahead with development of the SSBN(X), a program to build a new nuclear-missile submarine when the current Trident subs begin to outlive their lifespan in 2027. The budget pushes the onset of this development back by two years. The statement accompanying the budget declares this delay “a manageable risk.” (That’s an understatement.) The savings from this delay are considerable: $600 million next year and $4.3 billion over the next five years. Most of the nuclear-weapons programs are not in the Pentagon’s budget but rather in the “Atomic Energy-Defense” account of the Department of Energy. The amount requested for this account next year is $17 billion. Surely there are other “manageable risks” to be had by cutting this hefty sum. Letting half of the nuclear arsenal rot would have no effect on our ability to deter a nuclear attack. There’s also $781.7 million for the first year of construction on a new nuclear aircraft carrier (they usually take about five years to build). Does the Navy really need 11 carriers to perform all its missions? And are all those missions necessary? Carriers are expensive enough; but each carrier, besides carrying a lot of planes and sailors, is but the lead ship of a “carrier battle group,” which includes a complement of cruisers, destroyers, and other ships, all of which are also expensive. The Navy also wants $3.2 billion to buy two more Virginia-class submarines (the kind that carry conventional weapons) and $900 million for advanced procurement on yet another. Again, what are the scenarios where more subs are needed? By contrast, look at some of the weapons that have actually been used in the conflicts of recent years (and not just in Iraq and Afghanistan). For instance, there’s the Joint Direct Attack Munitions (JDAMs), aka the GPS-guided “smart bombs” dropped by high-flying planes with pinpoint precision. These things cost almost nothing. The Air Force and Navy are requesting 4,350 of them at a total cost of $204 million. That’s about $40,000 apiece. Or take the Predator unmanned aerial vehicles (“drones”). The Pentagon wants $884 million to buy 24 more (about $35 million each). The point isn’t that the military can get by entirely on smart bombs and drones and that the big things, like subs and aircraft carriers, aren’t needed. The point is that generals and admirals need to start justifying the perpetuation of these big things—many of which are bigger and more gold-plated than they need to be—especially given their price tags in this fiscally tight era. Much of what’s going on here is sheer momentum. The military machine doesn’t turn on a tight corner. Many senior officers in the defense bureaucracy rose through the ranks in an era when fighter planes, submarines, and aircraft carriers were the driving forces behind the entire military budget and military plans. This takes time to shift. Another part of what’s going on here is what used to be called “military Keynesianism.” There’s no denying it, contracts to build huge weapons systems mean lots of jobs—way more jobs than building, say, smart bombs and drones. True, it’s one of the most inefficient ways to create jobs. For every $1 billion spent on a weapons program, the government could generate more jobs by spending $1 billion to build nearly anything else. But the U.S. government doesn’t build much else (that would be “socialism”). So especially as jobs are still scarce, it’s unlikely we’ll see huge cuts in shipbuilding yards or aircraft plants. There are other odd discordances in the budget. For instance, the Army is having its personnel force cut the most drastically; yet the Army’s budget is growing, while the budgets for the Air Force and Navy are shrinking. Why? 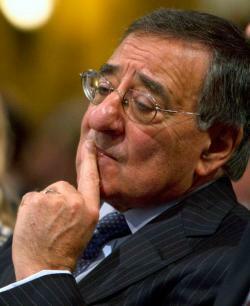 In rebutting the critics who say the cuts are too deep, Secretary Panetta and others have pointed out that, even with the Army’s personnel cut (from 562,000 active-duty soldiers to 552,100), it will still be bigger in size than the Army of 2001 (which had 480,000 active-duty soldiers). Two questions here: First, so? Second, why are there as many as 552,100 troops? What are they going to do? This is not a rhetorical question; the Army is hardly obsolete, but its senior officers are at this moment figuring out its mission in the post-Cold War, and now post-Iraq and -Afghanistan, era. Today the attention is leaning more heavily on the rest of the budget, which is where the fate of the economy—and the election—is more likely to be decided. But after the economy gets better and we’re out of Afghanistan and it’s a little bit politically safe to talk about these things, a serious discussion needs to be had on what the military should be doing, what kinds of weapons it really needs, and how much it needs to spend for them.